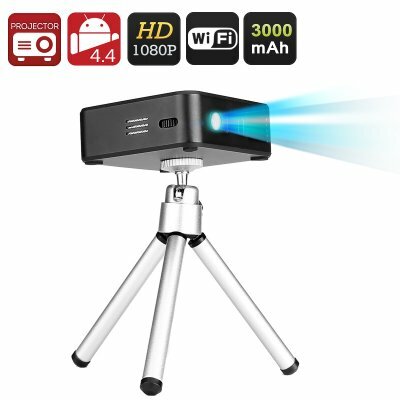 Successfully Added E05 Mini DLP Projector - Android 4.4, Quad-Core CPU, 1080P, Wi-Fi, 120 Lumen, 2000:1 Contrast Ratio, 3000mAh Battery to your Shopping Cart. Whether you are playing games, watching a movie, or giving a presentation – the E05 mini projector provides you with a small yet powerful platform to project and share all your media activities with your surroundings. With its Quad-Core CPU and 1GB of RAM this Android 4.4 packs some decent power and is guaranteed to have a strong performance. Its native 854 x 480 resolution can be displayed in 4:3 and 16:9 aspect ratios. This mini projector is capable of projecting everything. With a 2000:1 contrast ratio and capability to project 1080P FHD footage this small yet powerful projector is perfect for giving presentations, playing games, and even to use for projecting the latest HM movies. The E05 mini projector has everything you need to meet your portable entertainment demands. With a projection size up to 150 inches this mini DLP projector gives you the possibility to carry around a large sized screen in your pocket - great for in the office, at business trips, or simply at home during a movie night with your loved ones. With its Android 4.4 Operating System, Wi-Fi connection, and Google Play pre-installed the E05 DLP pocket projector offers an abundance of rich entertainment possibilities to ensure that you’ll never have to be bored again. Featuring a 3000mAh battery this mini projector brings up to 2.5 hours of continuous usage time so whether you’re watching a movie, browsing the web, or giving a presentation, the E05 mini projector offers you sufficient usage time for all your needs. Coming with a professional looking protection case and its own tri-pot this pocket sized projector is the perfect companion to carry along for leisure activities and business trips alike. The E05 mini projector comes with a 12 months warranty, brought to you by the leader in DLP projectors as well as wholesale electronic gadgets..
Arabic: - جهاز عرض DLP ميني - Chinese Simplified: - 迷你 DLP 投影机 - Czech: - Mini DLP projektor - Dutch: - Mini DLP-Projector - French: - Projecteur DLP Mini - German: - Mini-DLP-Projektor - Hebrew: - מקרן DLP מיני - Hindi: - मिनी DLP प्रोजेक्टर - Hungarian: - Mini DLP Projektor - Italian: - Proiettore DLP mini - Japanese: - ミニ DLP プロジェクター - Korean: - 미니 DLP 프로젝터 - Malay: - Projektor mini DLP - Norwegian Bokmål: - Mini DLP-projektorer - Romanian: - Mini DLP proiector - Russian: - Мини DLP проектор - Spanish: - DLP mini proyector - Thai: - โปรเจคเตอร์ DLP มินิ - Turkish: - Mini DLP projektörü - Vietnamese: - Máy chiếu mini DLP.